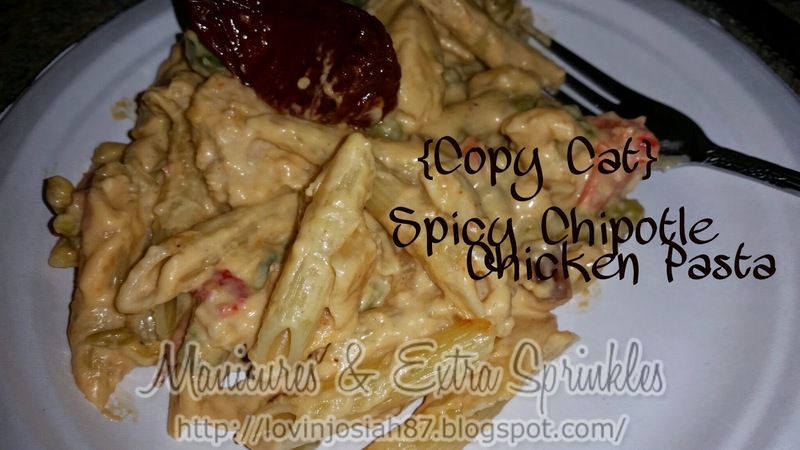 When I saw this recipe I just knew I had to try it because I had never made or ate anything with chipotles in it! (yes I know LOL) This was amazing! NOTE* I did not use any asparagus for this recipe. First you cut the chicken in bite size pieces. In a small dish mix together lemon juice and 2 tablespoons of honey. Add a pinch of salt and paper and blend well. Place the chicken breasts in a zip lock bag and pour the marinade over. I let this sit for as long as I could. In a large frying pan, heat 2 tablespoons of olive oil and put your chicken along with the marinade in. Turn the heat to medium and brown the chicken. When fully cooked put into a dish and place it to the side. Your going to cook your past now. While waiting for the pasta, your going to use the same pan you cooked your chicken in, turn the heat to medium and add 2 tablespoon of olive oil. Add your chopped onion and garlic and saute. Add the remaining Tablespoon of honey. Add your chopped red and yellow pepper and frozen peas into the mix and saute for a few more minutes. Your pasta should be done, so your going to drain the noodles, but don't rinse them! Now adding the all of whipping cream slowly to the frying pan, your going to mix it well and add the cheese. Then your going to add the chicken back and mix it well. 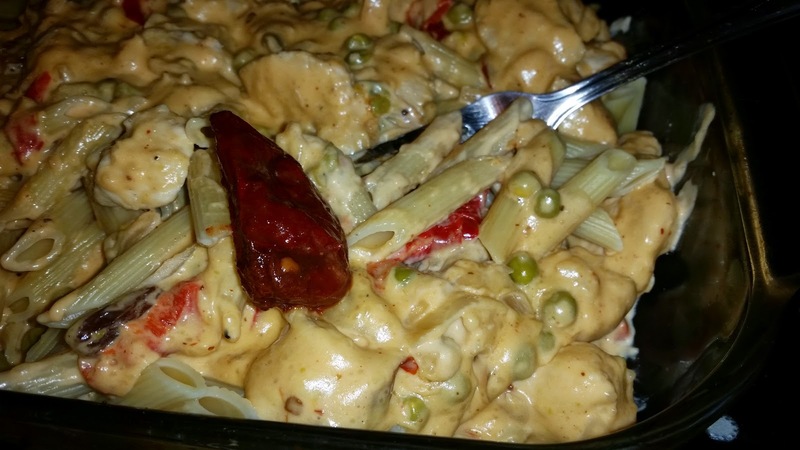 In a casserole dish your going to add the chicken sauce and pasta together. mixing as well as you can and VOILA!